You see that dinky little thing on the left? That, ladies and germs, is the once-mighty 30-inch Dell 3007. It’s taken 10 years of faithful patience. But at last it’s happened. I’ve seen the probable replacement for my trusty monitor. It’s none other than Philip’s new BDM4065UC. Poetic it ain’t, but never mind because this is the screen I have been waiting for this past decade. 40 inches, 4K, not TN, at least 60Hz and reasonably affordable (in this case circa £550, estimates vary for US pricing but sub $1,000 and possibly as little as $700 is the latest info). Is this overkill, just a hulking great HDTV that has no business being a monitor? There is a whiff of truth in that. But there’s also method in my madness. I encourage the sceptical among you to roll with me for just a bit. I believe the new high-end default has arrived. I’ve known this new 40-inch 4K format has been coming for a while. I had high hopes for reasons we’ll come to. Finally, it’s here. And very quickly I knew this panel is the one (or at least something very much like it) because it makes 30-inch monitors sitting next to it, the ones that hitherto had somehow been the displays that time forgot and had barely dated, look hopelessly quaint and immediately old fashioned. It’s as unnerving as it is unexpected. The likes of the Dell 3007 and its 30-inch brethren have been my screen honeys for so very long. But now they seem like a grey-scale CRTs in a 50s sci-fi flick. A pastiche of what was once the future. My 3007 seems small and square and mean and dingy. So, the Philips BDM4065UC. As I inferred, it’s 40 inches, it’s 4K (3,840 by 2,160 pixels in this case, as with most 4K PC monitors), it does 60Hz and its recommended retail price in the UK is £550. And here’s the thing. It’s a real PC monitor, but it’s also really a TV. By that I mean its LCD panel is really made for TVs. What we have here is a 4K TV with the TV guff taken out and a proper PC interface in DisplayPort added back in to allow for 4K at that 60Hz refresh rate. You can buy a very similar Philips 4K HDTV with mostly the same chassis and stand. But it doesn’t have DisplayPort. In the past, TV origins were a bad idea because that meant massive pixels. 1080p on a 40-inch panel just isn’t enough pixels not to look very, very ugly. But here, the TV thing means, firstly, that they’re banging out a tonne of these panels and suddenly 40-inch 4K is cheaper than 30-inch 2,560 by 1,600. Hurrah. Meanwhile, the 4K bit means the pixel pitch on this panel is actually slightly tighter than on a 30-inch monitor. But critically it’s not so tight you have to adjust Windows’ completely broken scaling settings. You can run at 100% and have legible text and icons of sensible proportions. I’ve included a standard-sized Dave(TM) for scale…but that really is a 30-incher on the left, doesn’t it look pathetic?! On the latest 28-inch 4K monitors, either everything is stupidly small or you have to bump up the scaling and everything looks crap. 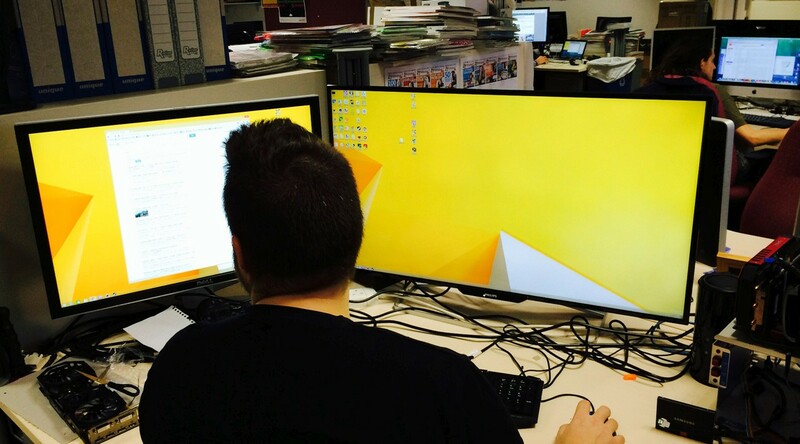 As for the question of whether it’s just too big to be a monitor, for me the answer is a simple and unambiguous no. It’s big and it’s just brilliant. But that’s in Windows, what about games? Here, the argument gets a little patchy. The obvious and immediate problem is that no single card can manage smooth 4K frame rates in each and any game, with everything maxed out. But there are some saving graces on offer. For starters, 4K over 40 inches means things look pretty good without anti-aliasing enabled. Not perfect. You get some jaggies and creepy-crawlies on edges. But it’s pretty good. Likewise, running interpolated at 2,560 by 1,600 looks pretty good, too. So you have those two fallback options for boosting frame rates. Even then, make no mistake, you’re going to want a serious graphics card. We’re talking Nvidia 970 or AMD 290 at minimum. That said if you can play at native 4K, bloody well do. It’s a genuine whole new thing / I’ve just seen the future experience. That amount of detail over such a huge panel area is a sight to behold. The scale is simply vast. Hop over here to get an idea of just how much bigger it is than something like a 23-inch monitor. In some ways it’s too good. Some of the textures in something like Shadow of Mordor look pretty ghastly and blocky. Few if any games will fully stand up to the full exposure that 4K brings. But that’s early adoption for you. In the meantime, the highs are very high indeed. It’s also worth remembering that you can pick one of these things up for the long haul. Gaming with a decent GPU will be pretty darn nice right away. In a couple of years, you can hook up the latest graphics and really make the most of it. More than just future proof, it’s actually ahead of its time. As for the specifics of this Philips monitor, they have me somewhat vexed. It’s a ‘VA’ or vertical alignment rather than IPS or TN, which has its pros and cons. The black levels are really nice and the colours are decently vibrant. But the viewing angles aren’t great, which is a major flaw on such a large panel. There’s a noticeable drop off in brightness along the bottom inch or two of the panel due to the limitations of the viewing angles. Completely non-adjustable stand is a potential deal breaker, unless a VESA mount comes to the rescue. On the subject of input lag, I haven’t done any detailed testing but if there is any, it’s not acute. I couldn’t detect any next to a Dell 3007. Of course, there’s no 120Hz-plus refresh. No G-Sync. No FreeSync. How much longer before an affordable 40-inch 4K monitor with those features turns up? I suspect it’s a long way out, if ever. You simply cannot have it all in one monitor. Then there’s the stand, which is entirely non-adjustable, betraying its HDTV origins. It does have a 200mm VESA mount at the rear. If I buy one, I’ll be making use of that VESA option. On the other hand the bezel is super slim and the chassis is compact, which only adds to the up-to-the minute feel, making those 30 inchers look even clunkier. Of course, one big worry is early adopter syndrome. The very first iteration of any new tech or form factor is usually a bad call. Wait for round two or three for bugs to be ironed out and prices to tumble. The thing is, that doesn’t always apply to screens. Even today, 30-inch panels aren’t much cheaper than they were at launch. And the earliest 30 inchers aren’t all that far off the latest for overall performance. Given the TV origins of the panel, maybe that’s not actually a relevant yard stick and we can indeed expect even cheaper 40-inch 4K monitors soon. But I doubt they’ll be dramatically cheaper really soon. And over six, seven, eight or more years, does it really matter if you paid £400 or £550 up front? All of which amounts to something of a personal pep talk. I’ve been talking the 4K talk. Will I walk the 4K walk? 4K at 28 or even 32 inches isn’t for me. Windows and the web remains fundamentally bitmapped, putting a limit on usable pixel pitches. Those lovely new 34-inch super-wide panels don’t quite do it either, as spectacular as they are in some games. If any of you are seriously considering this display, check out this HardForum thread for early adopter experiences. I’ve seen reports of non-square pixels on the Philips BDM4065UC. I cannot confirm or deny but if true, it again likely reflects the HDTV target market of its panel. For we mere gamers, it’s not a major issue. If you moonlight in design, it may be a deal breaker. Tagged with 4K, displayport, feature, LCD, Monitors, week in tech.